Magento 2 XML Sitemap extension generates and splits XML sitemap for Magento 2 store to boost up crawling by search engines. Create Magento 2 XML sitemap including all links on your store. Split XML sitemap into smaller sitemap.xml files by top level category, manufacture or time. Exclude selected links from Magento 2 XML sitemap file by category, product type or product ID. 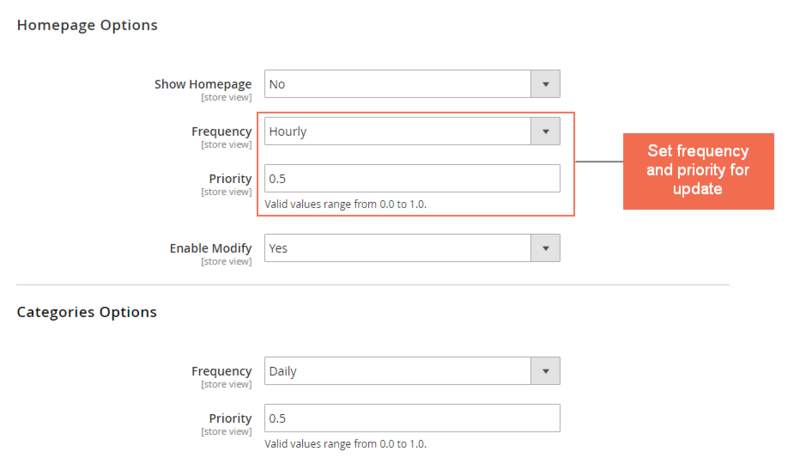 Set priority and frequency for updating Magento 2 sitemap. Add extra links to XML sitemap. Magento 2 XML Sitemap Extension is an effective tool for create and optimize the best Magento 2 sitemap for your business. Magento 2 XML Sitemap Extension auto-creates an XML sitemap containings links to all web pages on your Magento 2 store. It provides connections to Homepage, category pages, product pages, CMS pages of your store. Moreover, the extension allows admins to add external links (links to other websites) to the Magento 2 XML sitemap. And for the most important part, the XML sitemap is generated following your own configuration in Magento 2 backend. Exclude selected links from XML sitemap in Magento 2 by top level category, manufacture or time. In some cases, business owners want to hide some specific links from the search engine crawlers. Magento 2 XML Sitemap Extension can perform this task very well. In the Magento 2 backend, admins can choose to hide selected links from Magento 2 XML sitemap by category, product type or product ID. As a Magento 2 store contains a massive number of links, admins may consider splitting the XML sitemap into smaller sitemaps. The crawlers, then, read each of the XML sitemap more easily. Magento 2 XML Sitemap Extension allows you to divide the Magento 2 sitemap by top level category, manufacture and time. Magento 2 Sitemap XML supports splitting sitemap by date, category and manufacture. You can choose this setting specifically for each page type in Magento 2 XML Sitemap Extension configuration at backend. By assigning this detailed settings in the XML sitemap file, you assure that crawlers know when to update your content and what to update first in the search result. For SEO purpose, admins may want the crawlers to index the links from other site which have connection to your site. This advanced feature can serve well that purpose. As mentioned above, to get your business in the search result , you need to let them know what is delivered in your websites. Moreover, as a Magento 2 ecommerce site always has a dynamic content and pages which may not well connected (e.g: a product is only available when searching). Hence, Magento 2 XML sitemap is a must-have. It enables the crawlers to index your site more thoroughly. As a result, only if the crawlers can read your site into details, your content can be delivered to buyers through those powerful search box. In the time when people Google everything they want to purchase, Magento 2 XML sitemap are playing an essential part for a boost in sale through the page ranking. Best Magento 2 Google XML Sitemap ever! I've tried different extensions with similar features, but they somewhat didn't fit my sites. Your extension, in contrast, works well without bugs. Thanks to Magento 2 Google XML Sitemap, we can freely add and update our Google position for better SEO. Well done and keep it up! If you Magento 2 site has a large number of links then this module will be the best choice. Help the XML sitemap much more organized by spliting the sitemap into many smaller sitemap. v1.0.8: Fix error with config "Show Homepage"